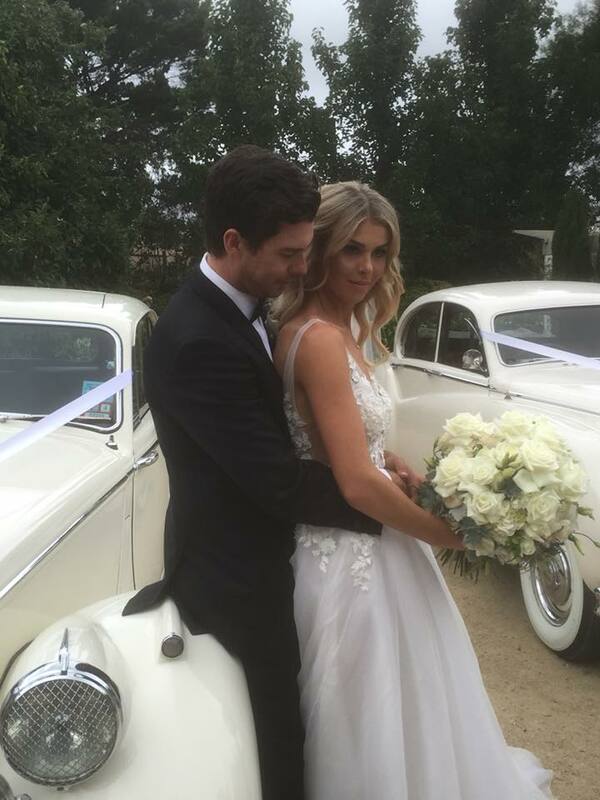 Katherine and Matt recently tied the knot at Dalywaters, Mornington. The lovely couple celebrated their love for one another with a ceremony and reception surrounded by family and friends in the beautiful scenery of Mornington. Katherine was stunning in her flowing gown fit for royalty. Not to mention her gorgeous bridesmaids in their lace gowns. Although it was slightly overcast, nothing could rain on the newlywed’s parade. With perfect people, scenery and classic cars. Katherine and Matt’s wedding was like a fairytale come true! JC Jags classic wedding cars are perfect for any occasion. Adding the finishing touches to Katherine and Matt’s elegant wedding, our cars bring a final touch of class and vintage beauty to any special occasion. Our classic wedding cars are stylish, comfortable, and add another special touch to your wedding day. We love seeing the joy of weddings and are committed to your satisfaction. Matching the gowns, flowers, and romantic mood, our ivory wedding cars made the happy couple look like royalty. But it’s important that our clients are treated like royalty too. Our expertly maintained cars are driven by professional uniformed drivers who will always be on time and put you first. We love being a part of your special day and all of our staff will look after you from your initial consultation until the end of your reception. Considering a classic car for your wedding day? JC Jags would love to hear from you! Congratulations to Katherine and Matt, the team at JC Jags wishes you the very best.